We all reach for the spice jars in colder weather, to pep up a savoury dish or give a kick to a classic bake. If your favourite winter spice is cinnamon, why not join in with our Just Desserts club next month? It's ginger that I go mad with, whether ground, freshly grated or stem. Or, in this recipe, all damn three. You don't have to add all three types of ginger if you want a less fiery finish - leave out the stem ginger and fling in some nuts, chocolate chips, or dried fruit instead. Try sprinkling sea salt over the top if you want a sweet/savoury fix too. There's something very comforting about brownies - that temptingly rich, chewy, almost truffly centre. Combined with a shiny, cracked top, you've reached brownie perfection. 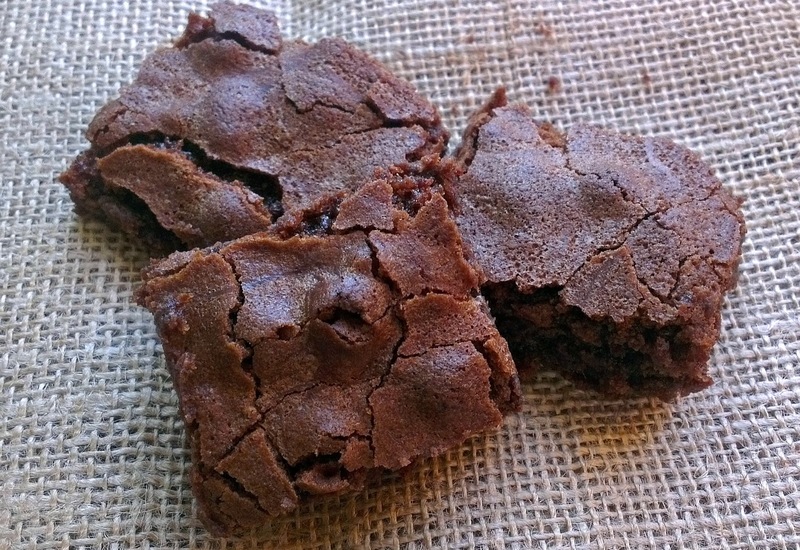 For the best brownies, beat the sugar and butter really well and gently fold in the dry ingredients. Bake until slightly underdone, as they'll continue cooking out of the oven. Preheat the oven to 180C/350F/gas mark 4. Line a baking tin (ideally around 18cm by 28cm, and 5cm deep, but they'll be ace whatever you use) with baking paper. If the paper overhangs the tin slightly, it'll be easier to lift the brownies out. Beat together the sugar and butter until light and fluffy. Gradually beat in the eggs anad vanilla essence. In a separate bowl, stir together the flour, cocoa, baking powder, ground ginger and grated ginger. Fold this flour mix into the wet ingredients. Gently stir in the stem ginger, then pour the brownie mix into the tin. Bake for 30-35 minutes until slightly springy in the middle, and a skewer inserted comes out with a few crumbs. Leave to cool for five minutes, then lift out on the paper and leave on a wire rack to cool. Cut into 16 pieces and eat while still slightly warm. Thanks Hayley, glad you like the look of it! What a nice idea. Enjoy. Cor, yes please! Love chocolate and ginger.